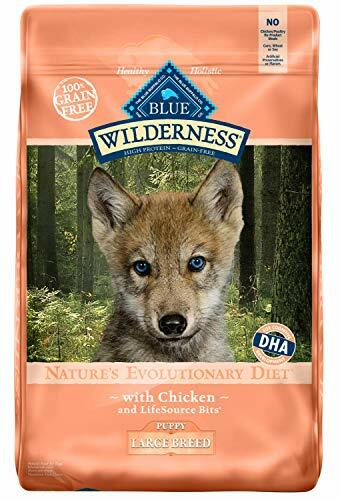 Blue Buffalo makes the best food for German Shepherds of 2019. Their Wilderness formula for large breed puppies is just right when it comes to nutrition and taste. 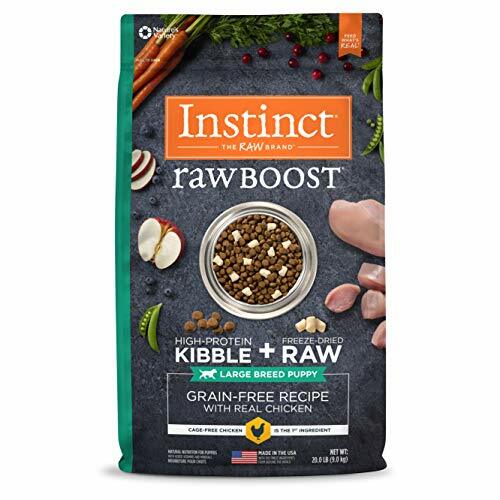 Your German Shepherd pup will gobble it up and you can rest easy knowing she'll get the right nutrients for her growing body. Read more about Blue Wilderness Chicken Recipe for Large Breed Puppies below. So you have a German Shepherd puppy? Are you ready for this? You are embarking on an incredible adventure of love, companionship, and partnership. German Shepherds are amazing dogs. They are loyal, protective, intelligent, strong, and they can be stubborn. It’s your job to care for this puppy, provide her proper nutrition, attention, and training. I won’t lie, it won’t be easy, but the rewards are well worth the time and effort. A male German Shepherd will grow up to be between 66lbs and 88lbs, while a female will grow to be between 49lbs and 71lbs. Starting out at an average of 1lb at birth, a German Shepherd puppy will reach 75% of his or her full growth at age 6 months. That means she will grow by 50 times in six months! The first few months of puppyhood are when the most growth happens. Proper exercise and nutrition are incredibly important during this formative time. It’s not something you can put off and fix later. Poor nutrition, especially for larger breeds, will lead to physical health problems that can’t be remedied. But don’t worry! We’re here to help. We’ve done the research and know how to choose a diet that is best suited to your growing puppy. German Shepherds are considered a large breed, since they are more than 50lbs at adulthood. Large breeds grow differently than small and medium-sized dogs so you need to consider more factors about their food. For all puppies, the most important aspect of their food is the quality of the ingredients. A healthy, complete, balanced diet will be made of whole food ingredients with quality sources of proteins and fats with added vitamins and minerals to promote immune health. The next thing to look at is the guaranteed analysis. Look at the percentages of protein, fat, and fiber. Dogs need a lot of protein; it should be the main ingredient. And healthy fats are essential for proper growth. A small amount of fiber is important to proper digestion, but too much can cause problems. For more information, check out this article on choosing puppy food. For large breeds specifically, like your German Shepherd, you also have to look at the number of calories and the percentages of calcium and phosphorus, as well as the ratio to each other. Large breed puppies’ growth differs from other puppies’ because they grow quickly at first and then take a long time to mature. German Shepherds are not fully physically mature until 3 years of age. The proper amount of calcium and phosphorus is essential to healthy skeletal and muscle growth. Otherwise, skeletal problems like hip dysplasia can result. German Shepherds are already at a higher risk of hip dysplasia than other dogs so it’s important not to increase that risk. Proper caloric intake ensures that your puppy is not malnourished, but at the same time does not become overweight. Excess weight puts unnecessary strain on your puppy’s growing skeleton, which is another contributor to physical problems like hip dysplasia. So what should the numbers be? The percentage of calcium should be in the range of 0.7-1.2%. The percentage of phosphorus should be in the range 0.6-1.1%. And the ratio of calcium to phosphorus should be in the range of 1:1 to 1.5:1. The number of kilocalories per kilogram should be in the range of 3500-4000. We include this information for you in the products we recommend below. Want: Chicken, Duck, Turkey, Flounder, Whitefish, Salmon, Buffalo, Beef, Pork. These words are specific so there is no room for questionable sources. Words like “meal” and “deboned” are ok.
Avoid: Poultry, Meat, Animal. Notice how these words are generic. The phrase “by-product” is ok if the company is trustworthy; it can mean things like neck, tongue, liver, which are good; it can also mean hooves, hide, and hair, which are bad. Want: Chicken fat, Canola Oil, Coconut Oil, Herring Oil, Salmon Oil, Flaxseed Oil. Again, these words are specific. If you see the phrase “preserved by mixed tocopherols,” that’s a good thing as it’s a great source of vitamin E and has other benefits. Avoid: Animal Fat, Fish Oil, Mineral Oil, Poultry Fat, Vegetable Oil. These words sound good, but they are generic so there is a lot of room for undesirable sources. Want: Barley, Millet, Brown Rice, Oatmeal, Oats (all whole grains! ), Peas, Sweet Potatoes, Potatoes, Corn. Avoid: Cereal Fines, Potato Product, Brewers Rice, Fermentation Solubles, Mill Run. These are cheap fragments and fillers that provide no nutrition to your puppy and are only used to save producers money. Want: Specific fruits and vegetables. Often the carbohydrate sources include sufficient fiber. Want: Chelates, Ester C, Calcium Ascorbate, Fruits and Veggies (blueberries, raspberries, pumpkin, spinach, carrots, blackberries, squash, broccoli, etc), Broths (of specific animals), Liver, Rosemary, Sage. A﻿﻿voi﻿﻿d:﻿﻿ Sweeteners (fructose, sucrose, sorbitol), Dyes, Artificial Flavors, Menadione (artificial vitamin K), Corn or Wheat Gluten, Fermentation Solubles. (35% minimum Protein, 14% minimum Fat, 6% maximum Fiber, 1.2% minimum Calcium, 0.9% minimum Phosphorus, 1.33:1 Calcium to Phosphorus, 3551 kcals/kg) The main ingredients include deboned chicken, chicken meal, tapioca starch, peas, turkey meal, pea protein, tomato pomace (source of lycopene), and chicken fat (preserved with mixed tocopherols). Inspired by the diet of wolves, this is a grain-free, protein-rich recipe. With DHA to aid in neurological and retinal development, your puppy will be smart as a whip. Blue uses high-quality whole food ingredients like chicken, sweet potatoes, blueberries, and carrots. It even sounds delicious to us! They add essential vitamins, minerals, and antioxidant to support the immune system during the busy time of puppyhood. With special thought to calcium and phosphorus levels, as well as caloric density, this is a great formula for a puppy that will grow into a strong, powerful, active dog; just like your puppy will! (38% minimum Protein, 16% minimum Fat, 6% maximum Fiber, 1.1% minimum Calcium, 0.9% minimum Phosphorus, 1.22:1 Calcium to Phosphorus, 3760 kcals/kg) The main ingredients include deboned chicken, deboned turkey, yellowtail ﬂounder, whole eggs, whole atlantic mackerel, chicken liver, turkey liver, chicken heart, turkey heart, whole atlantic herring, dehydrated chicken, dehydrated turkey, dehydrated mackerel, dehydrated chicken liver, dehydrated turkey liver, whole green peas, whole navy beans, red lentils, chicken necks, chicken kidney, pinto beans, chickpeas, green lentils, alfalfa, natural chicken ﬂavor, lentil ﬁber, and herring oil. This recipe is PACKED with protein for growing lean, strong muscles and providing tons of energy for your active puppy. It is also calorie-limited to reduce joint stress and promote a healthy body weight. It is also grain-free and low-carb. The ingredients are diverse and nutrient packed to promote healthy, whole body growth. Your puppy will love all of the protein sources that mirror what she would be munching on in the wild. Orijen uses fresh, regionally sourced ingredients so you know it’s going to be good. (33% minimum Protein, 14% minimum Fat, 5% maximum Fiber, 1.2% minimum Calcium, 0.9% minimum Phosphorus, 1.33:1 Calcium to Phosphorus, 3652 kcals/kg) The main ingredients include chicken meal (source of glucosamine and chondroitin sulfate), peas, chickpeas, chicken, chicken eggs, chicken fat (preserved with mixed tocopherols and citric acid). This recipe is packed with protein and free of grains. Nature’s Variety adds in freeze dried raw pieces that are delicious and nutrient rich. The ingredient list mimics what your puppy would find in nature. There are great sources of DHA, Omega-3, and Omega-6 to promote healthy neurological development as well as keep your puppy’s skin and coat healthy. There are no fillers, but plenty of probiotics to support digestion and ideal levels of calcium and phosphorus for proper skeletal growth. (26% minimum Protein, 12% minimum Fat, 5% maximum Fiber, 1.1% minimum Calcium, 0.9% minimum Phosphorus, 1.22:1 Calcium to Phosphorus, 3520 kcals/kg) The main ingredients include deboned chicken, whitefish, chicken meal, oatmeal, peas, ground barley, ground brown rice, salmon meal, tomato pomace, and chicken fat (preserved with mixed tocopherols).This recipe is calorie-controlled for controlled energy intake for proper growth for a large breed puppy, along with proper amounts of calcium and phosphorus. 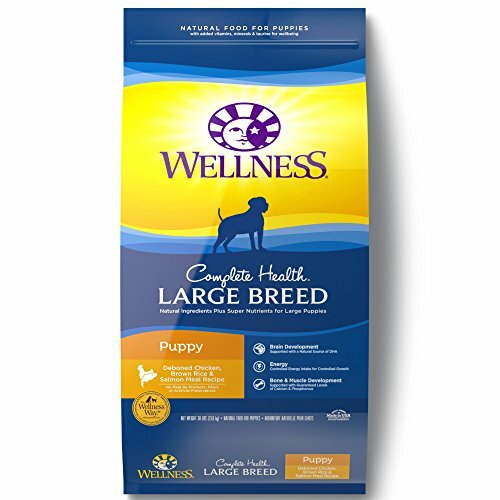 It includes less fat than Wellness’s regular puppy food to ensure consistent, steady growth.The ingredients are nutrient rich whole foods your puppy will love. Wellness aims for promoting whole body growth. (26% minimum Protein, 14% minimum Fat, 3.5% maximum Fiber, 1.08% minimum Calcium, 1.02% minimum Phosphorus, 1.06:1 Calcium to Phosphorus, 3809 kcals/kg) The main ingredients include duck, chicken meal, chicken, oatmeal, pearled barley, brown rice, menhaden fish meal, lamb, potatoes, dried tomato pomace, dried whole egg, and chicken fat. 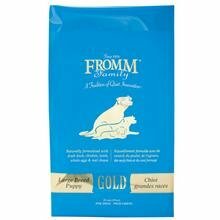 Fromm is a family company that prides itself is whole, natural, high-quality ingredients to provide the best nutrition for your puppy. This formula is specific to larger breeds and their unique growth. The density of nutrients will promote lean muscle growth, strong bones, and high brain and eye development. Prebiotics and probiotics aid in easy digestion. The salmon oil will make your puppy’s coat silky and shiny. You won’t find any wheat, corn, or fillers. So now you know what to look for and what to avoid. You have an important choice ahead of you and you have all the information to make the right decision about what is the best puppy food for German Shepherds. By providing complete, balanced nutrition for your young pup, you will be able to avoid many of the health risks that come with having a large breed, like a German Shepherd. Hip dysplasia occurs when the head of the femur (thigh bone) doesn’t fit properly into the acetabulum (hip socket). With time, the bones rub together resulting in inflammation, which is painful and uncomfortable and can lead to arthritis. If left untreated, a dog will experience constant pain and limited use of her legs. The treatment for hip dysplasia is normally a total hip replacement. German Shepherds, along with other larger breeds, are at risk of bloat (or gastric torsion). This is the swelling and twisting of the stomach, in which stomach gases cannot be released. It can be fatal. If you see signs of bloat, go to the vet immediately. Symptoms include an enlarged abdomen, drooling, labored breathing, paleness in the nose and mouth, vomiting, and a weak pulse. Causes of bloat include eating too quickly, eating at an awkward angle, eating too much, and exercising too quickly after eating. German Shepherds are often susceptible to allergens. This can be improved or avoided with a good diet. Dogs often react to allergens with skin problems like itching, poor coat, hot spots, rashes, and dryness. German Shepherds often experience intolerances to foods as well as other digestive issues like exocrine pancreatic insufficiency and pancreatitis. If you suspect your puppy has a food intolerance, changing her food is the best way to go. Try a limited ingredient diet and switch the protein source, which is often the cause of the intolerance. Learn more about puppies with sensitive stomachs ﻿﻿here. The most important thing is that her food is made of quality ingredients. A considerable amount of the time, a puppy is not intolerant of chicken, but intolerant of the poor quality of their food. That’s why it’s so important to research the companies you purchase from so you can establish trust. Thanks for reading about the best dog foods for german shepherd puppies. I hoped you learned something and feel confident moving forward. At ReadySetDogs, we aim to provide you with quality, complete information to help you make the best choice for your dogs. If you have any questions, feel free to comment below or contact us.